If one strays outside of the Lake District into the Scottish borders one can find the other familiar geometries identified originally by professor Thom. One such site is Allan Water, near Hawick, which, despite its remaining upright stones now being used as scratching posts by cattle, similarly adheres well to Thom’s Type I ‘egg’ geometry, where the two internal back-to back pseudo – Pythagorean triangles dimensioned formed sides of lengths 11-13-17 in units of half megalithic yards. The perimeter of this stone ring is 151.3 feet. A second example is Borrowston Rigg, near Lauder, which is the largest known Type II ‘egg’ with a perimeter of just under 450 feet. The stones may be small, but the geometry aligns very accurately to Thom’s Type I egg design, originally discovered following his extensive thorough theodolite surveys. I first began to take an interest in this collection of stone rings in 1992. Family connections in Scotland took me through the Lake District at least twice annually, and for some years I was living near Carnac in southern Brittany, also the home of spectacular Type I and Type II egg designs, one of each mark the ends of the famed Le Menec alignments. In addition I had an old friend who lived near Ulverston. Each visit up to the family home would include a stop at one or several of the Lake District sites, often with a theodolite, ropes, tapes and pegs. I was particularly drawn to Grey Croft ring, also known as Seascale, one of the few Type D flattened rings. In this design, the inner forming triangle cuts the line OC a third of the distance along the line (at point E) rather than a half, as per the ‘classic’ Type A design (see Thom’s original survey plan, below). Figure One. Seascale stone ring (also known as Grey Croft), a Type D flattened circle. Grey Croft also known as Seascale is today positioned on a Golf course adjacent to the Sellafield ex-nuclear power station and present day nuclear processing plant. Burl curtly and accurately describes this juxtaposition of an ancient and a modern power-point in just five words – ‘The stone circle is lovelier.’ [Burl 1995]. Work on this site was made difficult, due to security people hassling me about what my business was in bringing a theodolite into the area. However, Thom’s survey plan was checked over, and this was the first type D flattened circle that I had worked with. The line from Lundy to Carn Wen when extended northwards, leaves the West Wales coastline a mile from Mwnt, just north east of Cardigan, and re-enters the Welsh coast near Aberdaron, (Castell Odo) on the Lleine peninsula. It then exits Wales from Holyhead, as does the present day Irish ferry, then, travelling ever northwards, it cuts the southern shores of the Isle of Man, near Castleton, where there are prehistoric burial grounds almost on the beach, and it leaves just north of Peel, en route for Scotland, where it passes near Ayr, Prestwick, through Troon and thence on and up to leave the British mainland at the tip of Loch Eriboll near Durness (shown below). The British termination of the line is also the end of the recently revived Belinus line, whose modern champions are Gary Biltcliffe and Caroline Hoare. More recent landscape work undertaken by these two researchers and authors, based on Lewis’s work in the 60s, has since suggested that a line from the eastern tip of the Isle of Wight to Loch Eriboll and Durness point, formed what has been named the ‘Belinus Line’. This line has been duly explored extensively by these two authors, The Belinus Line becoming the title of a popular Earth mysteries book (published in 2012) in the style of The Sun and the Serpent (1989), by the late Hamish Miller and Paul Broadhurst. Both books are essential reading for those who wish to use an earth mysteries approach to understanding both geomantic effects and what humans have done with earth energies, consciously or otherwise. The north-south meridian line from Lundy to Loch Eriboll passes through a well known site on the Isle of Man, a Neolithic cairn [a major site still referred to as a ‘Celtic Hill Fort’ in many tourist guides] right on the summit of South Barra. What first drew my attention to its possible significance was that a line drawn from the South Barra monument towards the Lake District to east to Burnmoor East (a Type A flattened circle) made an angle of 21.45 degrees degrees with respect to an east-west line, that was little over a degree of being the apex angle within a lunation triangle – 22.619 degrees. A ‘little over one degree’ is nowhere near accurate enough to be worth pursuing any further in this line of work. But later I calculated that the line from South Barra, when taken up to Castle Rigg, passes right through both Castle Rigg and Long Meg stone rings. Bingo! The angle this line makes with respect to east is much more accurate (within a half degree over 90 miles) and is close to being the ‘Phi-angle’, 26.5651 degrees, the internal angle formed by the diagonals of a double square, a construction used to determine geometrically the value of Phi, via a simple construction involving the square root of 5 – the diagonal length, (the square root of five is numerically 2.236.. an irrational number). A double-square is two squares that share a common side. A diagonal drawn across the squares from corner to corner has a length equal to the square root of 5 times the length of the square’s side length. Each individual square has a diagonal the square root of 2 times the length of the square’s side length. The diagram below shows this geometry. 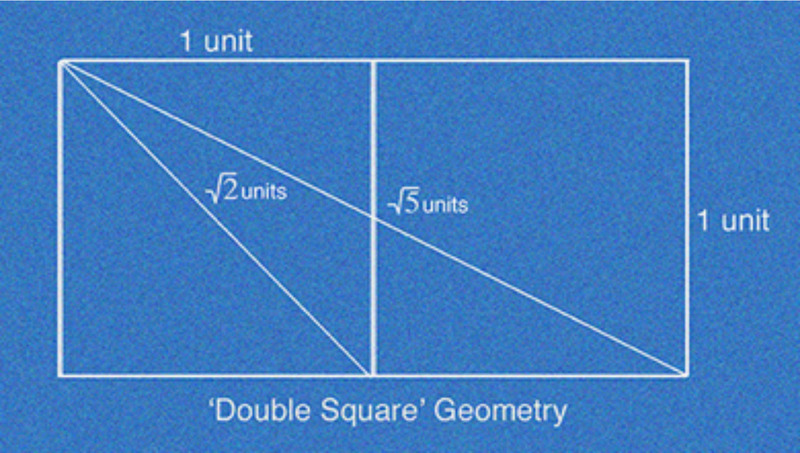 The geometry of a double-square. Figure Three. The line from South Barra summit to Long Meg via Castle Rigg. Length 90.1 miles. Angle from e-w = 27.25 degrees. Double square angle = 26.565 degrees. Over distances of above 25 miles, the earth’s curvature begins to need addressing in the measured angle using Google Earth. The straight line you see joining the three locations above is actually not straight at all. 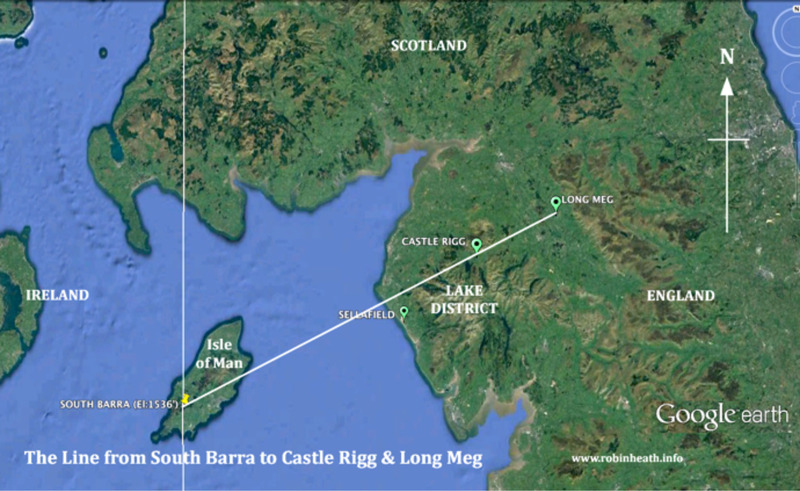 Due to the curvature of the earth, the start angle from South Barra has to be higher than the double square angle in order to pass through Castle Rigg and Long Meg at the doubles square angle. This can be checked out by drawing the line from Castle Rigg to Long Meg on Google Earth – which is 19.3 miles and gives an angle of 26.88 degrees with respect to an east-west line,. At just under 99% of the angle of a double square and now well worth pursuing). The problem facing ‘ley hunters’ is that, over long distances, unless they possess a good grasp of spherical geometry as used in geodetic solutions to ‘straight’ lines on the landscape, they lay themselves wide open to announcing ‘ground-breaking’ discoveries that are simply not real. Fortunately for lengths less than twenty miles, this problem of distortion can often be neglected. The book that saved my bacon in this respect was The Astronomical and Mathematical Foundations of Geography by Charles H Cotter (1966, Hollis & Carter). If the very title gives you the hee-bee jeebies, then possibly your leyhunting research would be better confined to the investigation or discovery of shorter leys! Google Earth was not yet available in 1992/3, it was OS maps that were checked and long hand and hard sums undertaken with a scientific calculator to be sure that the earth’s curvature was corrected for. 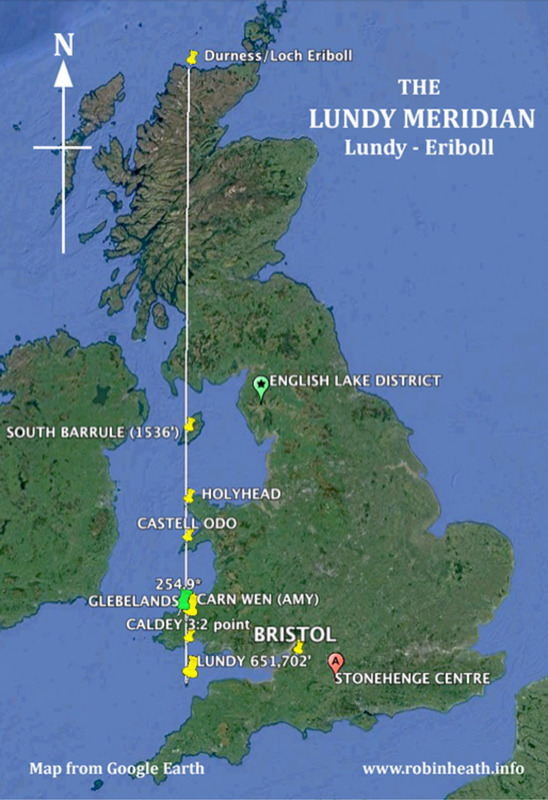 This work was part of an experiment that was investigating the Lundy-Barra – Eribol line for having been part of a bigger prehistoric ‘National Grid’ of surveying points similar to the more recent trig points set up in Victorian Britain for similar purposes. This Lake District experiment seemed to clinch the matter. Three major Neolithic sites, including perhaps the two of the best known stone circles in Northern Britain, were connected by a ‘straight’ line. The two large and very old stone rings, Castle Rigg and Long Meg were connected as the opposite corners of a double-square construction, to within 99% accuracy. The Long Meg site gets its name from the large twelve foot high menhir that has always stood as an outlier to the south-west of the (later) ring . This very attractive red standstone menhir is inscribed with spirals and cup and ring marks. In recent centuries the ring has been known as Long Meg and her Daughters. Long Meg ring comprises the daughters part, no doubt once women turned into stone for dancing on the Sabbath in true anti-pagan Church tradition, while Long Meg herself has been somewhat downgraded to being an ‘outlier’, or, in earlier times, a Witch turned into stone. The menhir and the ring are not the only surviving megalithic remains at the site. Within half a mile to the north-east of the ring can be found another ruinous circle, some 20 foot diameter and known as Little Meg. A mere shrimp compared to the 360 foot diameter of Long Meg’s daughters, even Little Meg has something to add concerning the geodetic qualities of this entire site. 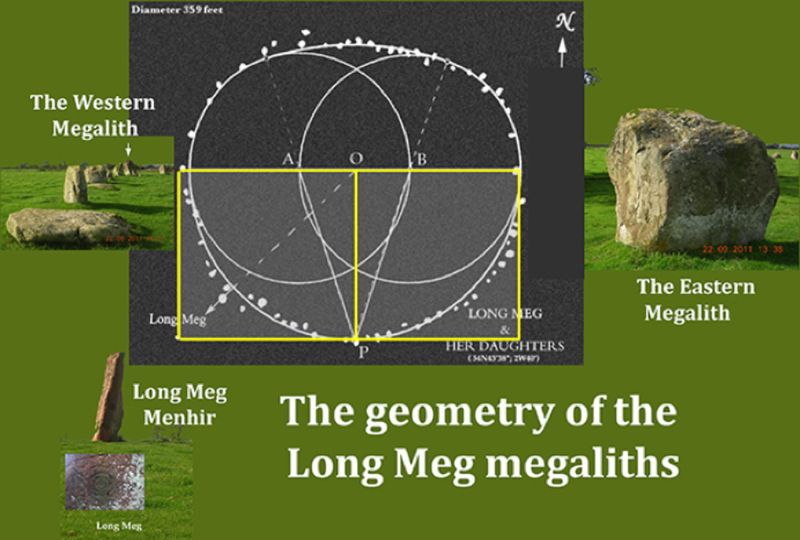 For example, it is interesting to note that the most accurate line (to the double square geometry) that can be drawn between Castle Rigg and the Long Meg site is that taken through the Long Meg menhir and up to Little Meg, as shown previously, (and below, figure seven). Does all this indicate that prehistoric surveying had been employed in the siting of major megalithic monuments? It took me until 1994 before my work demanded that I revisit these sites to further address this question. I was asked by Helena Frances of the Hermes Centre in Surrey to prepare a week long course for her students that would include this research during three days of hard graft in the Lake District. Helena and I did a ‘reccie’ to prepare more surveys and check aspects such as intervisibility between sites. We surveyed the ruins of Orton ring, a few miles from Tebay services on the M6, and two other smaller circles. During this trip my old Watts theodolite went missing from right under our noses, never to be seen again. In 1997, I visited all the above stone circles again with my partner, Trish. Ten years later, in 2007, we sailed to the Isle of Man on a 90 foot wooden sailboat, Keewaydin, with a small group of friends, and managed to visit various megalithic sites including S Burra and the Meyall Hill stone tombs above Port Erin. This latter site is the IOMs only stone circle, and is larger but has similarities with the monument Cerrig Y Gof (‘memorial stones’) near Newport in the Preselis. Both sites have something of a stone circle about them, but mixed with a dash of dolmen, several capstones and rectangular chambers arranged in a symmetrical circular design around a central ‘henge’ or circular field. The Meyall Hill site has a quite splendid panoramic view to Ireland and, for that special apres site visit moment, a really good tea shoppe may be visited on the way down to Port Erin afterwards. Later in 2007 that I was asked by a fellow megalithomaniac called Howard Crowhurst, to give a presentation or two at a gig he was organising in Plouharnel, near Carnac. Howard, a Yorkshireman, has lived in France since the 70s. The meeting with Crowhurst was brokered by my brother Richard, who had taken a group to visit Howard’s excellent megalithic museum and tour centre in Plouharnel some years previously. The outcome of this necessary preamble is that Howard knew several sites within the major monuments at Carnac and elsewhere that had employed two-squares geometry in their design. 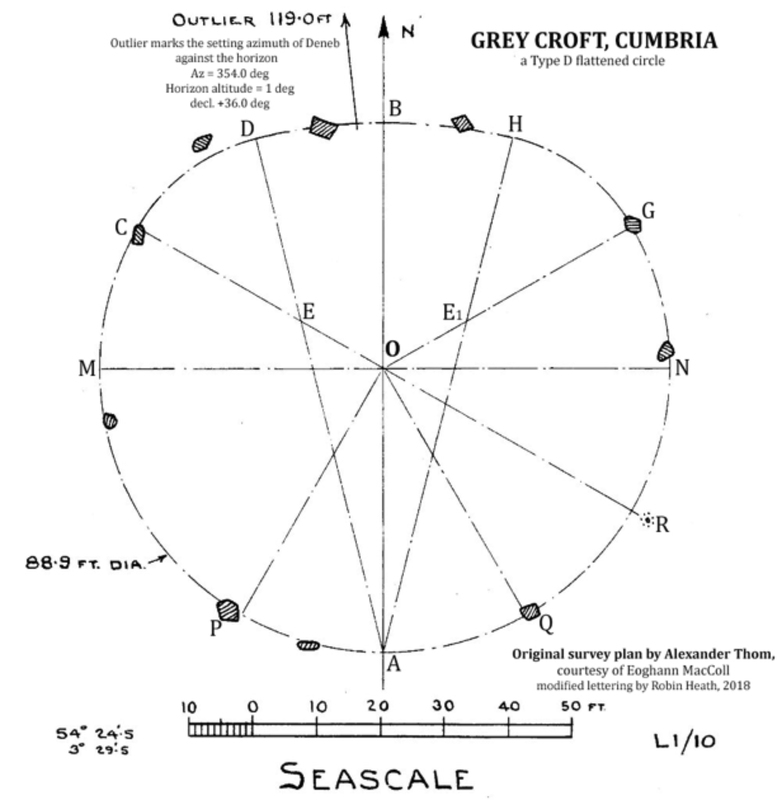 This rekindled my interest in the lakes circles and led to further surveying visits to Castle Rigg, Long Meg and Burnmoor each and every summer from 2008 to 2011. Once one superimposes the line from Castle Rigg to Long Meg onto the geometry of the Long Meg site, it revealed a fractal like similarity on a smaller scale to the double square between Castle Rigg and Long Meg (illustrated below, Figure four. 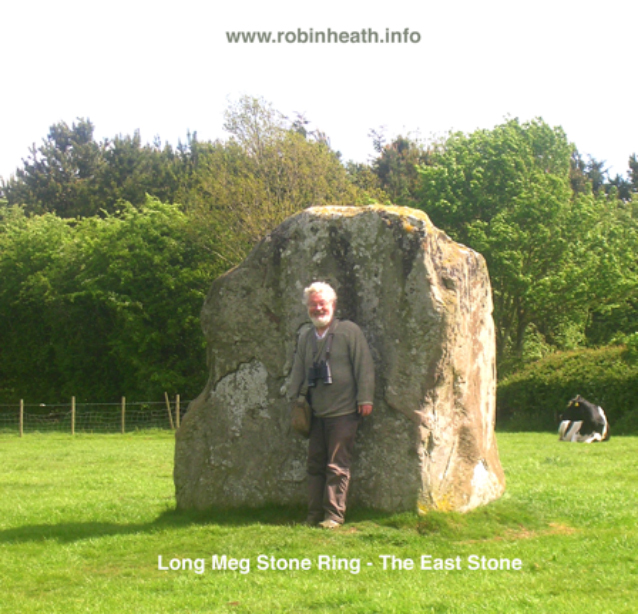 Not shown is that the extension of this line – the diagonal between the menhir and the easternmost stone in the ring – cuts through the Little Meg ring. Figure Four. A line from Castle Rigg cuts through the Long Meg menhir (Outlier) and then through the stone ring before passing through the centre of Little Meg. Figure Five. A 2009 survey revealed that the geometric layout of the Long Meg site is based on a double square, with three corners defines by the three largest stones comprising the monument, and a most interesting property in the light of this present research. Another serendipidous event took place during a visit to Long Meg in early August 2010. A member of the Cumbrian Archaeological Society flourished a small map at me. This showed the wider extent of a recent archaeological survey of the entire Long Meg site, the details of which I have included here, based on a photograph I took of this somewhat rough map. The smaller double-square of the previous illustration (figure six, below) now may be a fractal of the larger archaeological plan, where the rectangle has an identified Neolithic fort at top left and Little Meg at top right. 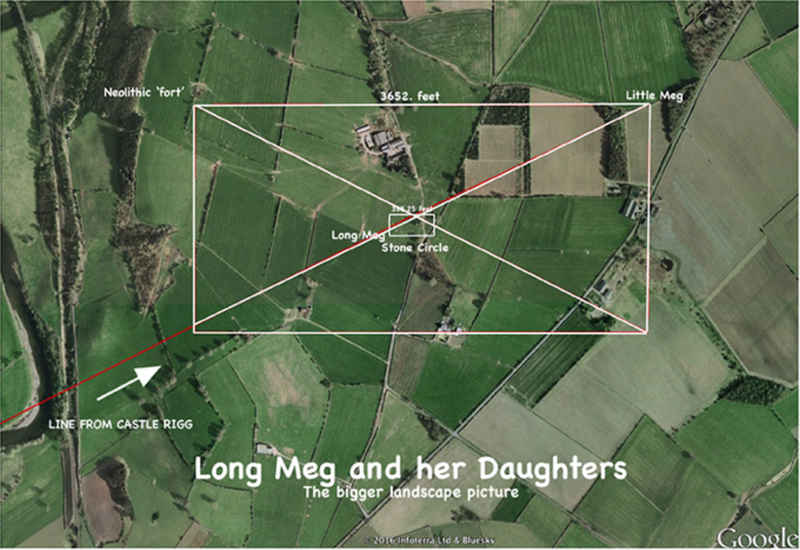 Little Meg thus becomes integrated into the design of what one might term the bigger Long Meg landscape. The incoming line from Castle Rigg defines the lower left corner and passes through the menhir ‘outlier of Long Meg. Nothing at all has been identified on the lower right hand corner, just as for the smaller Long Meg rectangle. This point is located on heavily agriculturalised private land. The top length of the enlarged rectangle is ten times the size of the ‘double square’ rectangle that defines the east-west diameter of Long Meg ring. Overall, these are satisfying results that support the argument for prehistoric surveying in the Lake District. 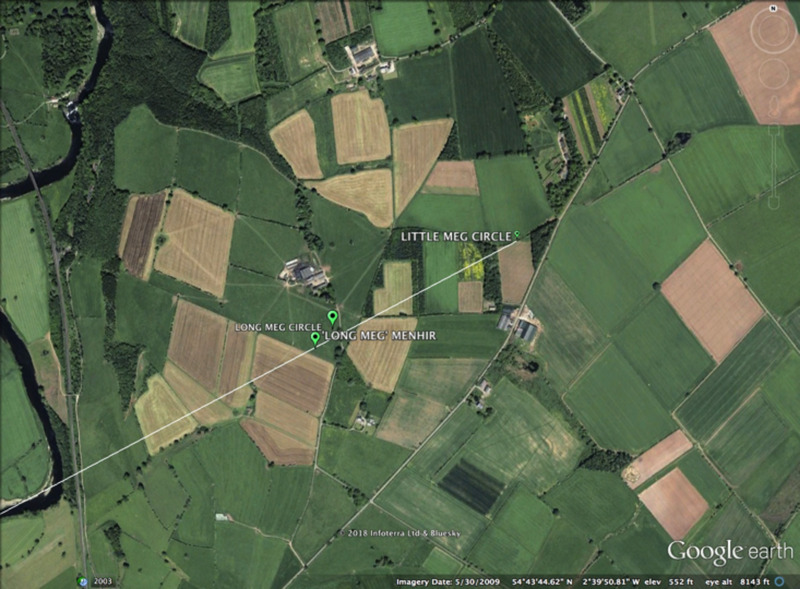 The Long Meg site assumes an even greater significance. Figure Six. 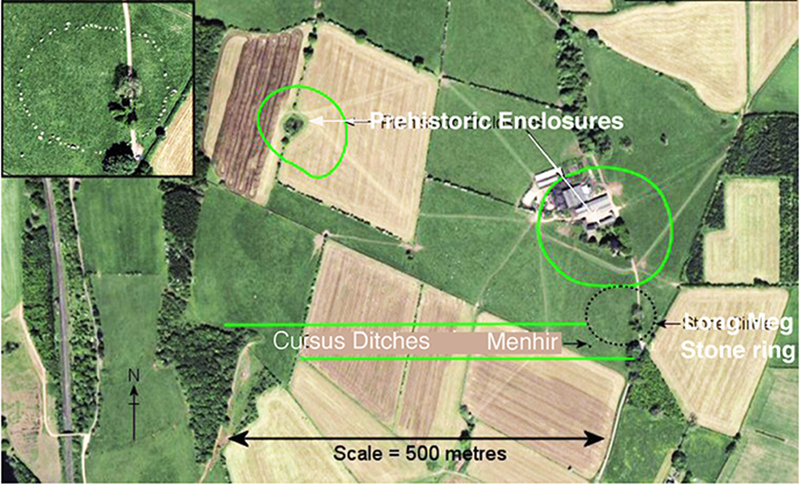 Recent interpretation work by archaeologists of the Cumbian Archeological Societ, suggests the presence of a ‘Neolithic fort’, a prehistoric enclosure and some cursus ditches, a rather similar collection to the contemporaneous work going on near Stonehenge and Durrington walls at this time. Figure Seven. The overall ‘fractal’ structure of the wider Long Meg landscape compares with the previously revealed double-square geometric construction of Long Meg, revealed through the application of megalithic science. During surveys undertaken between 2007 and 2011, I measured the east-west diameter of Long Meg ring with an accurate surveyor’s tape. This diameter is marked at each end by humungous blocks of granite, (see the photograph of the easternmost stone on page 14, at the end of this article) of a size that makes one ask: How could these ever have been moved or lifted through human effort? The distance between the inside faces of these apparent immoveables measured most interestingly. At, 353.45 feet, and between their outside faces measuring 365.15 feet, to any astronomer this would immediately suggest that these distances represent the lunar and solar year, 354.367 days and 365.2422 days respectively, enshrined in stone such that one foot equals one day. Here we have two of the most unmoveable, untamperable stones on the site. These two boulders define the geometry of the Long Meg site, which includes the Menhir stone, and they store within their placement, the length of the lunar and solar year, scaled at one day = one foot. The enlarged landscape rectangle depicted on the previous page is ten times larger, and its longer length consequently measures 3652 feet, or ten feet representing one day. To find a similar connection between the foot and the astronomy of the Sun, Moon Earth system, it is useful to look at a well documented curiosity that occurred in China during the late Stone Age, which leads this inquiry into the area of megalithic science. At first sight the history of human measure sounds like a dull subject to steer well clear of, which is exactly what the academic world did in the mid nineteenth century. This left a huge source of valuable information unavailable for future historians and archeologists. Having studied this subject for twenty years, I would suggest that dull is not the word, and metrology deserves to be studied by eveyone who wants to better understand prehistoric or ancient history. The foot provided the root of all ancient systems of measurement. We know this extended back into the Neolithic period partly because Prof Joseph Needham, the Sinologist, without knowing it, found evidence supporting the possible ‘invention’ of the foot in defining the length of the year in Northern China, during the ‘Yellow River’ period, the earliest dynasties. From 1954 onwards, Needham wrote a series of books entitled Science and Civilisation in China . These books are about the history of science in China and are very well regarded. During his travels, Needham discovered that the ancient Chinese astronomers divided up the equator into 365 and a quarter divisions. This matches the earth’s equatorial circumference to the earth’s orbital period around the sun – the solar year. The Time period became represented by a length, the circular perimeter of the equator. What Needham did not note is that if the equatorial circumference of the earth is taken to be 24,901 miles, the present figure, then this is 365.25 x 360,000 feet (or 365,250 x 360 feet). 1. The first way of writing down the product of these two numbers, 365.25 x 360,000, enables the division of the equatorial circumference by the solar year. This represents the earth’s orbital period around the sun and it ‘stores’ knowledge of the length of the solar year in days as a length that relates directly to the earth’s principal dimension. This results in one day-degree around the equator being represented as a length of 360,000 feet or 69.177 miles. The equator is the only true circle within all the key constants of the geoid, the shape and size of the earth, and our present culture retains 360 degrees as the very convenient and highly factorisable number of degrees in a circle. It is therefore not unreasonable to question whether or not the foot length, which lies at the root of the structure of ancient metrology, was designated and dimensioned to provide this convenient astronomical, geometrical (in the sense of ‘measuring the earth’) and metrological arrangement, through the above relationship between the solar year and the size of the earth. Whether you agree with this suggestion or not, the geodetic significance of the foot is not in doubt. The two numerical constants were fixed as 365.25 days leaving the remainder as a very nicely convenient and familiar 360,000 feet. This fixed the foot measure as the peculiarly enduring unit of length we still use today. It is hard to understand why until one understands and reckons with its ubiquity throughout all history of measurement. It is probably why, in 1637, an Oxford professor, John Greaves, on visiting and measuring the Great Pyramid, inscribed a foot measure on the wall directly above the King’s chamber, with the message ‘to be observed by all nations‘. He then signed it, J Gravius. This act was no obscure professor-vandal indulging in some British nationalism via his graffiti message. Greaves’ measurements of ancient monuments throughout the ancient world later fed Sir Isaac Newton with the dimensions that enabled him to rediscover what the ancient world had known all along – the size and shape of the earth. From this came the understanding and laws of gravity. It is now possible to expand on the identified geodetic fact that South Barra, Castle Rigg, Long Meg menhir and Little Meg all lie on or very, very close to a line drawn from South Barra to Little Meg. Some would call this a ley, or a ley-line, but recognition of the line’s angle also identifies that Castle Rigg and Long Meg define the corners of a ‘phi’ double square, which massively enlarges the significance of this geodetic arrangement. Further work then hurried along apace with visits to other stone circles in the Lakes. Some of this work was usefully undertaken with a lightweight theodolite loaned to me by fellow megalithomaniac Andrew Davies. This instrument made it much easier to obtain rapid (if less accurate) basic data at sites. Figure Eight. Three other major stone rings in the Lakes District – Grey Croft (Seascale), Burnmoor East and Swinside (Sunkenkirk) stone circles are located to mark out three corners of a square. The fourth corner (if it ever existed) now lies submerged under the sea off the Cumbrian coast. The most significant factor in all of this work was that these three sites accurately replicate, in size and same orientation to the cardinal points of the compass, the dimensions of the Castle Rigg – Long Meg squares. 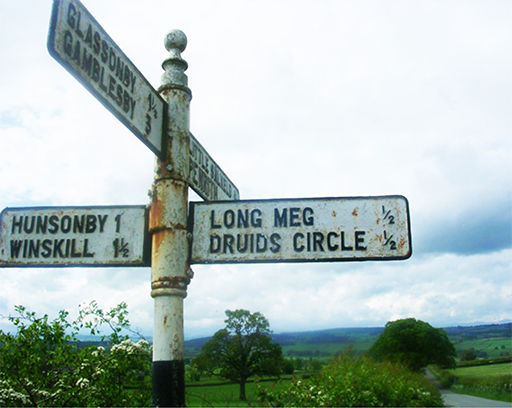 The Castle Rigg-Long Meg rectangle gives an average figure of 8.652 miles for the short side length. The three sites or Seascale, Burnmoor E and Swinside gives a measure of 8.81 miles. Both geodetic squares possess side lengths that are very closely equal to one eighth of one degree in length, which averages at around 8.647 miles. This is 69.176 miles for the degree, a figure within a cool 99.99% of one degree (see previous paragraphs). Suddenly, these two networks of massive stone circles become nodes that provide us with a rare commodity in this type of work – repeatable data affirming that a megalithic geodetic project once took place here in the Lake District. 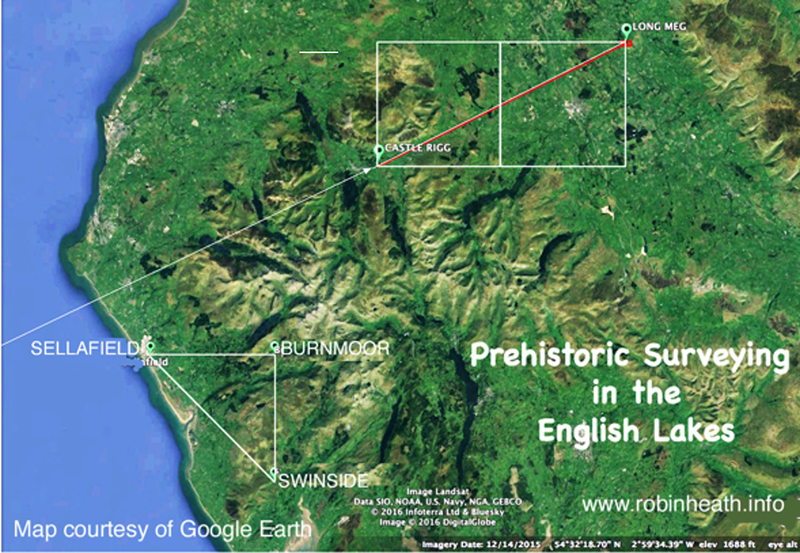 The evidence presented here suggests that some kind of surveying process was being undertaken before 3000 BC, in the English Lake District. We might suggest that this had something to do with identifying the length of one degree across the surface of the Lake District. 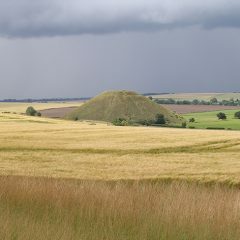 If this is the case, then here is a wonder of prehistory, no less than Stonehenge, or Avebury, for it also suggests that our prehistoric forebears were familiar with the size of the earth, complex geometry, and the basis of counting and measuring angles, qualities that are entirely absent from our history books and particularly books on the history of science. Our modern culture simply states that such things would have been impossible for people in the Stone Age to even comprehend, let along implement. This leaves us surprisingly biassed against the fair assessment of any new evidence that demonstrates just these very capabilities. However, there have sometimes been high ranking and scientifically trained people who have kicked out at this attitude, by producing data that supports a much higher level of capability and knowledge in the people that built the thousands of monuments that have survived across the landscapes of Europe. Professor Alexander Thom, stated in a 1970 BBC documentary that, “In terms of their thinking abilities I think they (the megalithic builders) were my superiors”. The belief that only physical objects can survive from prehistory – not the ideas, beliefs or creative inspirations of the culture responsible for those objects – has made it all too easy for the more intangible ‘things’, such as angles and measurements, to become sidelined,neglected or forgotten, which is plainly what has occurred in our culture. However, these ‘other things’ are a type of artefact, other than the physical objects of present day archaeology, and here we see them speaking the universal language of number and science, taking the form of lengths and angles between megalithic monuments or the (latitude dependent) horizon angles of solstice sunrises or sets, and of major moonrises or sets. A megalithic scientist looks for, works with and can find these ‘other artefacts’ within the landscape, and thereby gains access to the Neolithic mindset, a rich world that is revealing the true capabilities of Neolithic people and to which the conventional archaeologist or historian neither believes in nor has any means of access. This situation could, of course, radically change, and this article, one hopes, must go some way to encouraging such a change. Figure Nine. The easternmost stone at Long Meg. Built to endure!